From scissors and the sewing machine to tools, toys and boxes, we have ideas on how to store every item so that you can find it easily. Not only will everything be organized, but also out of your way. No more tripping over balls, moving the rake in order to open the car's door, and trying to find a spot where you can store the rug. All can have their place and none will be in your way. If garage organization seems like a good idea for you, trust the services of our company. We take your personal needs and the space of your garage into consideration and assure you that our garage storage systems can fit in the smallest place. Whether you need a small or huge cabinet, overhead storage solutions or ceiling systems for lightweight items, we can make it happen. 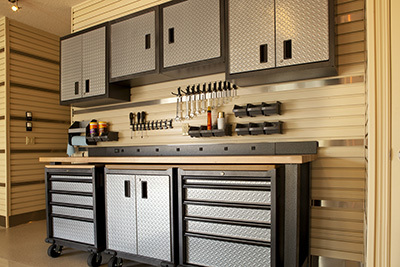 We offer customized and clever garage storage solutions and also flooring ideas. Once everything is neatly stored, why not invest in epoxy flooring to be sure that stains will be removed easily and the floor will be resistant and long-lasting? Garage Storage Solutions in Channelview is here for every one of you and ready to cover all such needs. All you need to do is call!